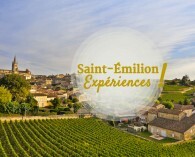 Saint-Émilion is a veritable outdoor museum, founded according to the legend by a modest hermit ... city full of history, perched on a rocky promontory, Saint-Emilion and its vineyard draw their originality from the limestone which offers an exceptional soil vineyards. 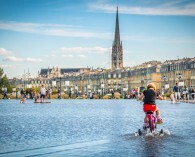 In the 8th century, a Breton named Emilion, a native of Vannes and famous for its miracles, decided to leave his homeland to retire and devote himself to prayer. 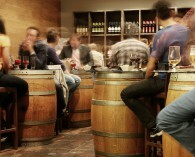 Along the Atlantic coast, he became a monk and then moved to Ascumbas, former name of the city of Saint-Emilion. Joined by some Benedictines disciples, he founded the first religious community and evangelize the population; thus creating a large monastic city in which the faithful gave his name. 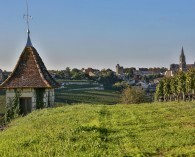 Several religious communities have lived for centuries in the village, attracted by the cult of Émilion as evidenced by the numerous monasteries, convents and churches still visible. Thus, between the 8th and 18th century, the Benedictines, Augustinians, Franciscans, Dominicans and sisters Ursulines coexisted or succeeded in the heart of the city. 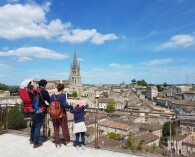 The architectural frame of 8 towns forming the Jurisdiction of Saint-Emilion testifies, meanwhile, the constant evolution of the landscape and people: a religious heritage (churches, chapels, crosses), hundreds of wine chateaux, houses master, cellars, pigeon houses, windmills or laundries. 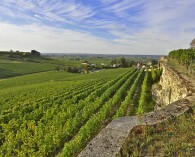 Thus the Jurisdiction of Saint-Emilion was listed as World Heritage World in 1999, the title of "Cultural Landscape". This was the first vineyard classified in the world.